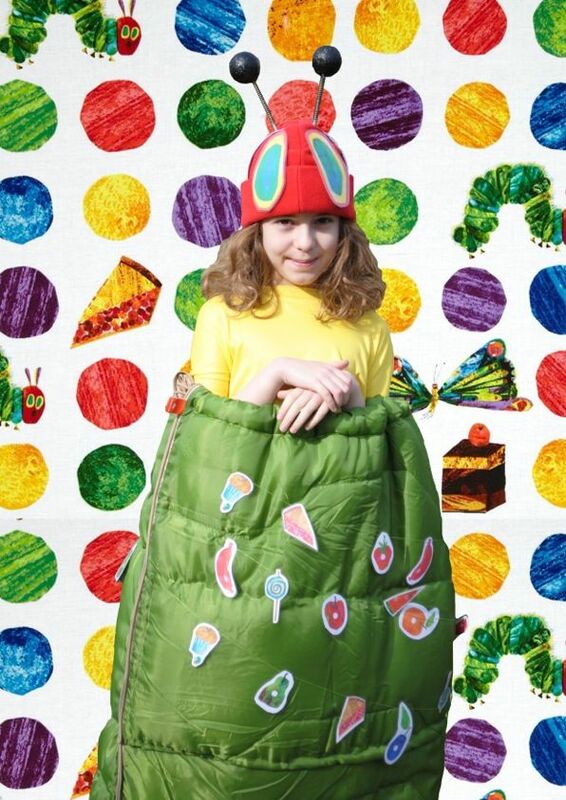 I decided to go as Eric Carle’s The Very Hungry Caterpillar. We took my brother’s green sleeping bag and sewed it up so it was the right size for me and I wouldn’t fall over. I put my red beanie hat on and some boppers. We printed out the eyes for the caterpillar and some of the food that he ate and sewed them on. Then Mummy made me a little yellow suit for the butterfly’s body and some lovely wings which we sewed on the back. Then I can shed off my green caterpillar body and become a beautiful butterfly! This entry was posted in Book Review and tagged Eric Carle, The Very Hungry Caterpillar, World Book Day. Bookmark the permalink. Hi, remember me, your Granddad Alan’s cousin Ken? My wife Beryl, an ex head teacher, are very impressed with your blogs. The variety of authors and subjects you choose are very interesting. I love your Very Hungry Caterpillar.